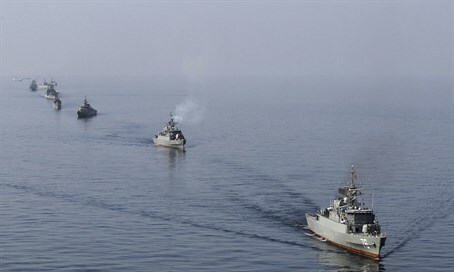 Iranian Army Commander says Tehran plans to send warships and destroyers to Latin America, to work with anti-US states. Iranian Army Commander Maj. Gen. Ataollah Salehi on Saturday announced that Iran intends to deploy warships and destroyers in Latin America, in a sign of the attempts of the leading state sponsor of terror to expand its military cooperation with countries opposing the US. "We intend to take a longer stride in marine voyages and even go towards friendly states in Latin America," Salehi told reporters at the southern port city of Bandar Abbas, according to the semi-official Fars News Agency. Speaking at a ceremony welcoming back the Iranian Navy's 38th fleet after 75 days of international deployment, he said Iran intends to increase its cooperation with the navies of Latin American states. "The Navy is capable of deploying in that region," he asserted, while saying Iran is placing a priority on updating its navy with state-of-the-art weapons. Iran has been looking to expand ties with Venezuela, Bolivia, Brazil, Ecuador, Nicaragua, Cuba, Mexico and Colombia. According to the Iranian semi-official Fars, "Iran's strong and rapidly growing ties with Latin America have raised eyebrows in the US and its western allies since Tehran and Latin nations have forged an alliance against the imperialist and colonialist powers and are striving hard to reinvigorate their relations with the other independent countries which pursue a line of policy independent from the US." The move to create an axis "against the colonialist powers" continues Iran's position of hostility against the US, which has strengthened more and more ever since the controversial nuclear deal signed last July. Israel has warned the deal paves Tehran's way to a nuclear weapon. Just last month Iran indicated it intends to rapidly expand its naval powers, mere days after US Secretary of State John Kerry issued a warning call to Iran about its repeated missile tests breaching UN and US sanctions.